The 16th edition of Curb that launched Dec. 5 tells the narrative of movement, motion and change — of individuals and communities — as stories of forward progress, steps backward and static pause. 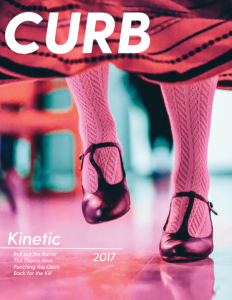 Curb: Kinetic, which developed through months of careful planning, hard work and late hours, is different from any other magazine philosophy Curb has adopted. Every year, 21 students in the School of Journalism and Mass Communication set out to create a magazine focusing on themes in the state of Wisconsin. This capstone course allows students to have full creative range and a professional experience in funding, designing, publishing and circulating an award-winning, nonprofit publication to alumni in Wisconsin. In early September, the students of Curb magazine met for the first time to plan what would become a 64-page print and online magazine. After a few days of brainstorming and pitching ideas, the staff recognized the role of change — either big or small — has in shaping Wisconsin’s identity. “Kinetic” looks beneath the current to understand the forces currently framing Wisconsin’s future, while preserving its past. Students in Curb magazine raised more than $11,000 to cover the costs of publication by hosting fundraisers, taking professional headshots, selling advertisements and apparel, firing up their ovens for a bake sale and reaching out to the community for crowdfunding efforts. Additionally, for the eighth year, Royle Printing in Sun Prairie donated half of the cost of printing. In order to create this multimedia publication, students created stories, videos and more for print and online versions of the magazine. This year, Peter Coutu, Curb’s online editor, made content on the website more data-visual than ever before, using numbers to help tell the story. The 16th edition of Curb will be distributed to more than 10,000 UW–Madison alumni across the state, and can be found in print on newsstands around the community and online at curbonline.com.